Algae have played a key role in the creation and evolution of our planet’s biosphere and they continue being a vital factor for the preservation and development of the Earth’s ecosystem. The American professor Russel Chapman, an excellent scientist and a brilliant expert when it comes to explaining our knowledge of algae to the general public, characterizes this group of organisms capable of photosynthesis as the “most important plants on Earth”. Which are the actual facts that support this idea? The first enrichment of our atmosphere in oxygen whose concentration started to grow about 2.5 billion years ago was due to the photosynthetic activity of the oldest group of algae, the so-called cyanobacteria (blue-green algae). This was a key moment in the evolution of life on our planet. Today blue-green algae are still an important component of water-based biocenoses and continue having the ecologically greatest impact together with other groups of algae (diatoms, green, brown, red algae and others). 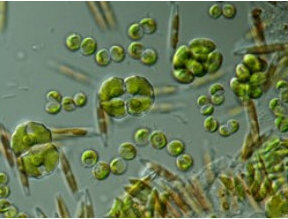 Altogether these algae are responsible for the production of about half the oxygen in our atmosphere. The other half is produced by land plants which first appeared about 500 million years ago and whose ancestors are the green algae. So, by photosynthesis algae process as much carbon dioxide as all land plants taken together. 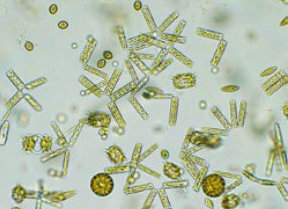 Algae and above all microalgae (phytoplankton) make up the primary biomass, which is the basis of the food pyramid both in the world’s oceans and in fresh-water bodies. 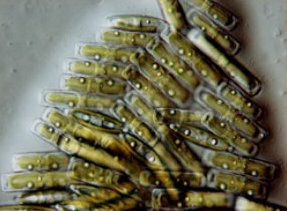 Microalgae are consumed by tiny animals (zooplankton) and then, further in the food chain, by fish and gigantic sea mammals. It is interesting to note and not known to everybody that the majority of all oil and natural gas reserves is nothing but the remains of ancient microalga plankton of the Mesozoic. So, algae directly or indirectly supply us with oxygen to breath, with food and also with liquid and gaseous fuel in the past, in the present and maybe also in the future. It all depends on how successfully algae-based biotechnologies will develop. Over a long period there was no other group of “plants” apart from algae that was so creative and played such an important role in the life of our planet!